Libyan leader Moammar Gaddafi vowed to fight on to his "last drop of blood" and roared at his supporters to take to the streets against protesters demanding his ouster, shouting and pounding his fist in a furious speech Tuesday after two nights of a bloody crackdown in the capital trying to crush the uprising that has fragmented his regime. It was the second time Gaddafi has appeared during the week of upheaval across his country. Swathed in brown robes and a turban, he spoke on state TV from behind a podium in the entrance of his bombed-out Tripoli residence hit by US airstrikes in the 1980s and left unrepaired as a monument of defiance. At times the camera panned back to show a towering monument of a gold-colored fist crushing an American fighter jet, outside the building. But at the same time, the view gave a surreal image of the Libyan leader, shouting and waving his arms wildly all alone in a broken-down lobby with no audience, surrounded by broken tiles dangling from the ceiling, shattered concrete pillars and bare plumbing pipes. "Libya wants glory, Libya wants to be at the pinnacle, at the pinnacle of the world," he proclaimed, pounding his fist on the podium. "I am a fighter, a revolutionary from tents ... I will die as a martyr at the end," he said, vowing to fight "to my last drop of blood." Gaddafi depicted the protesters as misguided youths, who had been given drugs and money by a "small, sick group" to attack police and government buildings. He called on supporters to take to the streets immediately to reimpose control and to attack the protest leaders. 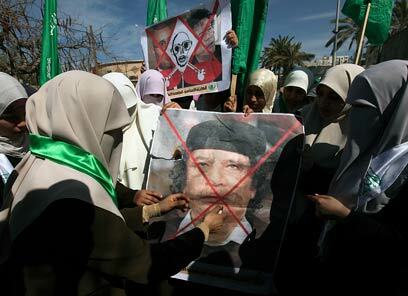 "You men and women who love Gaddafi ... get out of your homes and fill the streets," he said. "Leave your homes and attack them in their lairs. They are taking your children and getting them drunk and sending them to death. For what? To destroy Libya, burn Libya." "The police cordons will be lifted, go out and fight them," he said, urging youth to form local committees across the country "for the defense of the revolution and the defense of Gaddafi," even asking them to wear green armbands. "Let us show them what the popular revolution is like," he said. "Go out from your homes starting now." "Forward, forward, forward!" he barked at the speech's conclusion, pumping both fists in the air as he stormed away from the podium. He was kissed by about a dozen supporters, some in security force uniforms. Then he climbed into a golf cart-like vehicle and puttered away. His call could signal a sharp escalation of bloodshed in the Libyan capital of 2 million people after two nights of clashes. Streets in several neighborhoods were littered with the bodies of slain protesters Tuesday morning after a fierce crackdown through the night, as pro-Gaddafi militiamen shot on sight anyone found outdoors to crush protests. Streets in Tripoli were largely empty during the day Tuesday, except for residents venturing out to stock up on bread and other basics, wary of attacks by militiamen, said one resident. A helicopter was heard buzzing over downtown. But he said protesters were gearing up to rally again after nightfall, likely to be confronted again by the militias. "Everyone intends for tonight to be the decisive night." The UN Security Council was holding an emergency meeting, and Western diplomats pressed for it to demand an immediate halt to Gahdafi's retaliation against protesters. With international condemnation mounting, nations around the world were scrambling for ways to get their citizens out of Libya, and oil prices surged. The eruption of turmoil in the capital escalates a week of protests and bloody clashes in Libya's eastern cities that have shattered Gaddafi's nearly 42-year grip on the nation. Many cities in the east appeared to be under the control of protesters, including some oil-producing regions, as units of Gaddafi's army defected. Protesters in the east claimed to hold several oil fields and facilities and said they were protecting them to prevent damage or vandalism. The regime has been hit by a string of defections by ambassadors abroad, including its UN delegation, and a few officials at home. In response, Gaddafi's security forces have unleashed the bloodiest crackdown of any Arab country against the wave of protests sweeping the region, which toppled leaders of Egypt and Tunisia. Anywhere from 233 to 250 people are known to have been killed so far, according to estimates by the UN Office of the High Commissioner for Human Rights and the New York-based Human Rights Watch. Those numbers don't appear to include casualties from two days of deadly attacks on protesters in the capital, Tripoli - a sign of the difficulty of getting information out of the highly closed North African Nation. A doctor in the eastern city of Benghazi told The Associated Press a colleague at Tripoli's main hospital told him 41 people were killed in Tripoli during clashes Sunday night alone, but the number could not be confirmed, and it was not known how many died Monday and Tuesday. A Tunisian doctor on his side of the border crossing with Libya said he saw many Libyans wounded on the other side, waiting but blocked from crossing to get treatment. The head of the UN agency, Navi Pillay, called for an investigation, saying widespread and systematic attacks against civilians "may amount to crimes against humanity." The first major protests to hit an OPEC country - and major supplier to Europe - sent oil prices soaring to more than $93 a barrel Tuesday. A string of international oil companies have begun evacuating their expatriate workers or their families, and the Spanish oil company Repsol-YPF said it suspended production in Libya on Tuesday. It accounted for about 3.8 percent of Libya's total production of 1.6 million barrels a day. From nightfall Monday to dawn Tuesday, the pro-regime militias that have taken the forefront in the crackdown - a mixture of Libyans and foreign mercenaries - besieged protesters in at least five neighborhoods across the capital of 2 million people. One of the heaviest battlegrounds was the impoverished, densely populated district of Fashloum, one resident there told the AP. Militiamen shot any "moving human being" with live ammunition, including ambulances, so wounded were left in the streets to die, the resident said. He said that as he fled the neighborhood Monday night, he ran across a group of militiamen, including foreign fighters. "The Libyans (among them) warned me to leave and showed me bodies of the dead and told me: `We were given orders to shot anybody who moves in the place,'" said the resident. Like others reached in Libya he spoke on condition of anonymity because of fear of retaliation. Western media are largely barred from Libya and the report couldn't be independently confirmed. Another resident said commandos were in control of the streets and were stationed on rooftops, opening fire. "Life is paralyzed, even those who were shot can't go to hospital," he said. "No one is able to walk in the street." The week of upheaval in Libya has weakened - if not broken for now- the control of Gaddafi's regime in parts of the east. Protesters claim to control a string of cities across just under half of Libya's 1,600-kilometer-long (1,000 mile) Mediterranean coast, from the Egyptian border in the east to the city of Ajdabiya, an important site in the oil fields of central Libya, said Tawfiq al-Shahbi, a protest organizer in the eastern city of Tobruk. He said had visited the crossing station into Egypt and that border guards had fled. In Tobruk and Benghazi, the country's second largest city, protesters were raising the pre-Gaddafi flag of Libya's monarchy on public buildings, he and other protesters said. Protesters and local tribesmen were protecting several oil fields and facilities around Ajdabiya, said Ahmed al-Zawi, a resident there. They had also organized watch groups to guard streets and entrances to the city, he said. The day before, crowds of residents were looting a nearby military base for weapons, when a warplane flew overhead and dropped a bomb in a nearby open area, blasting a crater but causing no casualties, said al-Zawi, who was among those seizing ammunition, automatic weapons and grenades from the camp. "I think the pilot is a good man. He was given orders to bomb the camp but he didn't," al-Zawi said. "We needed the weapons to protect ourselves and the city from the mercenaries." In Benghazi, protesters over the weekend overran police stations and security headquarters, taking control of the streets with the help of army units that broke away and sided with them. Benghazi residents, however, remained in fear of a regime backlash. One doctor in the city said Tuesday many spent the night outside their homes, hearing rumors that airstrikes and artillery assaults were imminent. "We know that although we are in control of the city, Gaddafi loyalists are still here hiding and they can do anything anytime," he said. Gaddafi, the longest serving Arab leader, appeared briefly on TV early Tuesday to dispel rumors that he had fled. Sitting in a car in front of what appeared to be his residence and holding an umbrella out of the passenger side door, he told an interviewer that he had wanted to go to the capital's Green Square to talk to his supporters gathered there, but the rain stopped him. "I am here to show that I am in Tripoli and not in Venezuela. Don't believe those misleading dog stations," Gaddafi said, referring to the media reports that he had left the country. The video clip and comments lasted less than a minute. But Tuesday evening's speech lasted well over a half hour. During it, Gaddafi recounting his days as a young revolutionary leader who "liberated" Libya - a reference to the 1969 military coup that brought him to power - and his defiance against US airstrikes. He insisted that since he has no official title, he cannot resign. Gaddafi is referred to as the "brother leader," but is not president. He said he had not ordered police to use any force used against protesters - that his supporters had come out voluntarily to defend him. "I haven't ordered a single bullet fired," he said, warning that if he does, "everything will burn." He said that if protests didn't end, he would stage a "holy march" with millions of supporters to cleanse Libya. He demanded protesters in Benghazi hand over weapons taken from captured police stations and military bases, warning of separatism and civil war. "No one allows his country to be a joke or let a mad man separate a part of it," he declared. Meanwhile, the US government faced mounting calls for action against Libya. US Secretary of State Hillary Rodham Clinton called on Gadhafi to "stop this unacceptable bloodshed" and said the world was watching the events "with alarm." Senator John Kerry, the influential chairman of the Senate Foreign Relations Committee, called on the Obama administration to consider reimposing sanctions against Tripoli and said oil companies should cease operations in Libya immediately. "We're not without options, particularly in partnership with the broader international community," Kerry said in a statement that suggested Libyan commanders who participate in the crackdown could face international war crimes charges. Kerry, who has the power to scrutinize US foreign policy, said the Gaddafi government's "use of deadly force against its own people should mean the end of the regime itself." Libya's ambassador to the United States, Ali Aujali, resigned as Tripoli's representative and urged Washington to step up its rhetoric at the UN Security Council, saying the time has come to topple Gaddafi's regime. "I need the United States to raise their voice very strongly. This regime is shaking and this is the time to get rid of it," Aujali said on ABC's "Good Morning America." "Please, please, help the Libyan people. Help them. They are burning," he added. "We need the world to stand up by us." 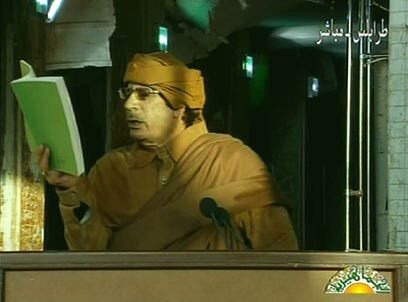 See all talkbacks "Libya: Gaddafi vows to fight on, die a martyr"